When I see food commercials or ads aimed at men, I usually see visions of shredded cheese raining down on a plate of nachos or a 1/4 pound sausage slamming onto a flaming grill while someone with an impossibly deep voice is suggesting that masculinity is directly proportionate to the number of calories in one’s meal. Now don’t get me wrong: all of these sound pretty tasty to me, but I wonder what purpose this kind of messaging serves. The “Work Hard, Play Hard” mentality is all well and good, but unless the “Work Hard” part includes working out or manual labor, it’s pretty hard to keep on top of all those calories. But I get it. It’s the bold flavors. It’s the ease of mixing a few tasty ingredients to quickly bang out a satisfying meal. It’s meat. And sauce. And needing a ton of napkins so that dinner feels like a contact sport. To that end, I’ve chosen a few of my recipes that have a proven track record with the men in my life. They’re packed with flavor and they’re all versatile, so you can prepare them as entrees, appetizers, or as something healthy to toss on nachos. They can be prepared ahead of game day. They’ll stain the couch when spilled. They go great with beer. My Chippy Chili has crushed tortilla chips incorporated into the recipe. 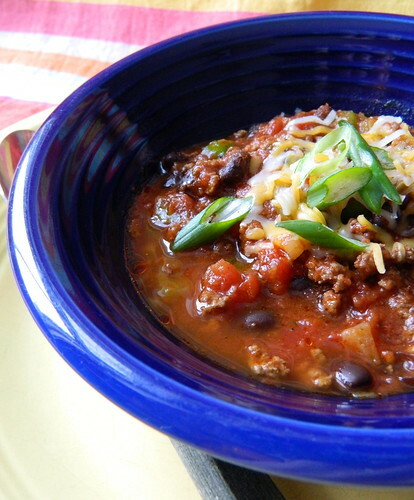 They give the chili a rich flavor and help to thicken it. You can make this chili with or without beans. I developed this Falafel Burger recipe for a Beef-Free Burger feature in “The Huffington Post’s” Healthy Living Section, and while it’s a great way to serve up a meatless meal to your vegetarian friends, most diehard carnivores still appreciate it for its rich flavor and texture. My Homemade Sausageis a low fat base recipe with three seasoning variations: Chorizo, Hot Italian and Sweet Italian.